Celebrate the Christmas season with a festive-themed Afternoon Tea at Royal Horseguards Hotel. Available between 1st December 2012 and 1st January 2013. 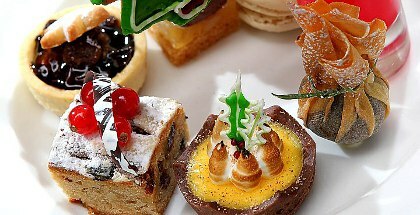 This delicious Afternoon Tea menu combines yuletide flavours with a unique festive flair and is perfect to enjoy snuggled up in front of the fireplace in the hotel's elegant lounge, which is beautifully decorated with festive garlands and a traditional Christmas tree. Upgrades include champagne, mulled wine or a seasonal cocktail from our Equus Bar. pretty much considering a ticket to fly over just for this tea. Dreamy pic.